Why The Unofficial Shelvoke & Drewry Website? Unofficial - because this website has no official connection with the Company:- Shelvoke & Drewry Ltd., of Letchworth, Herts (1922- 1992) but is purely a private undertaking by the author. Any infringement of copyright or trade names is purely accidental, and will be corrected on request. When our elder son suggested in the Spring of 2002 that I should try producing a website, I found there were few references to Shelvoke & Drewry on the Internet. This website has been created to correct that omission, and was launched in June 2002. S&D was a major employer. Within 10 years of the founding Shelvoke & Drewry the company employed 350 people, and had increased its original factory space by ten times. By 1980 the company workforce was over 1,000. Many families had more than one generation who earned their living at S&D. Harry Shelvoke was a strict employer, but the company engendered great loyalty from its employees. It never paid the highest wage rates, but employees found other company values more important than financial rewards. S&D is rightly remembered for sound engineering practices and innovative design. The SD Freighter, jointly conceived by Harry Shelvoke and James Drewry, was superior to anything that competitors could offer in its day. Its simplicity of control, low loading height, economy of operation, and advanced features such as automatic lubrication, clutchless gear changing and hydraulic tipping mark the Freighter as a historic stage in the evolution of vehicle design. Preserved vehicle restored to 1922 condition. 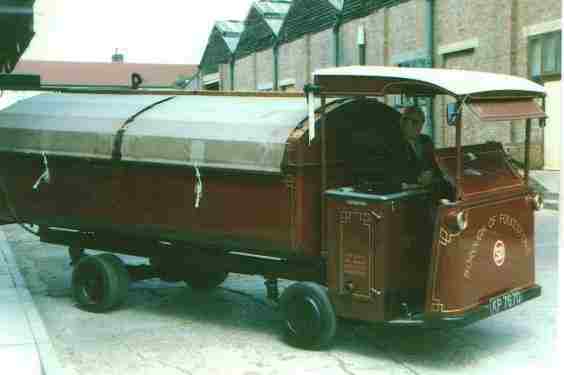 The S&D Fore & Aft tipper of 1950 was a major advance in refuse collection vehicles, and proved to be better than its competitors in design and operation. The SD Freighlifter range of Forklift trucks, introduced in 1952, enabled import restrictions to be overcome, and assisted in introducing mechanisation to industry following World War 2. The 27 tonne capacity Defiant Forklift, of 1972, demonstrated the company's expertise in designing and building a heavy duty range of trucks. In 1959 S&D introduced the Pakamatic model in response to the changing nature of refuse, and this vehicle with its aluminium compaction type body was an overnight success. This enabled S&D to capture 60% of the municipal market, and involved further expansion with the opening of the Blackhorse Road factory. In 1971 the Revopak model, which was able to easily deal with very bulky refuse, continued the success of the Pakamatic and Pakaejector models. The formation of the Special Purpose Vehicle (SPV) Division in 1974, allowed the experienced designers and engineers to design and produce a wide range of specialised vehicles. The fire appliance, crash tender and military markets all benefited from S&D's expertise. Sound engineering principles were more than amply demonstrated in the long service life of many vehicles. Even today, there are vehicles over 20 years old still in regular service. 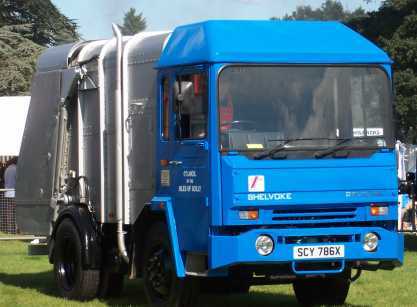 Shelvoke & Drewry had a reputation for rugged vehicles that gave a long economical service life. S&D's Contribution to the War effort 1939-45. 56,000 Tank sprockets & wheels for Churchill tanks. Engine Room Gear for Landing Craft including 2,800 cylinder blocks, 2,480 governors, 45,000 welded exhaust pipes. Undercarriage and Landing Gear for over 8,000 aircraft. With the death of Harry Shelvoke in 1962 the name Shelvoke died out in Britain. It is fitting that former employees, and enthusiasts for the company he founded, and steered to prosperity, and that bore his name, should seek to preserve his name in history. Many other people are worthy of recognition for their contribution to the refuse collection industry: Fernand Rey (Pakamatic concept etc. ), Tom Tillson & Frank Dean (Pakamatic design), Jack Wilkinson (Sales), Morris Davenport and Stan Quin (MD's) etc. S&D was a valuable engineering training resource in the Letchworth area. The Apprenticeship scheme, set up within a year of the founding of the company, not only produced a steady supply of skilled engineers who often spent over 30 years with the company, but also provided trained engineers who went on to provide a valued contribution throughout the engineering industry. In the days of National Service (1945 -62) the Royal Electrical & Mechanical Engineers (REME) regarded Shelvoke trained apprentices as being as good as those trained by the prestigious Rolls-Royce Company. During the 1980's the company's training school provided for other local engineering companies, in addition to its own training needs. S&D was probably your local dustcart. Made in relatively small numbers, the weekly visit of the dustman is recalled by many people. The strange appearance of the Freighter, the tipping antics of a Fore & Aft tipper, the gigantic jaws of the Revopak were all part of a scene that is no more. Shelvokes' products are remembered as a part of daily life - taking away the rubbish that we no longer want. Because the company is still missed. In a great measure due to Channel 4 Television broadcasting, in the Salvage Squad series in January 2003, a programme featuring the restoration of an S&D Revopak, contact is being made with many former employees of the company. Their message is unanimously: "It was a great company to work for, we had some good times, it gives us a sense of pride to have contributed to excellent products, and a reputation for friendly and reliable attention to the needs of customers. It's sad the company no longer exists." The preserved 'Salvage Squad' Mini Revopak . The author was a Shelvoke & Drewry apprentice from 1953 to 1960, and was employed by the company until the autumn of 1962. His father and uncle were also closely connected with the company. Having received a sound technical education, the author had a long and fulfilling career in the British engineering industry. This website is a tribute to all those who employed their efforts and skills to create a great manufacturing company, which sadly is no more.